Welcome to D&D Fishing Charters! Experience the unsurpassed beauty of the rugged west coast of British Columbia all year round in total comfort. D&D Fishing Charters leave from Sooke Harbour, which is a scenic drive from Victoria, BC, Canada and take you to some of the best fishing in the world. 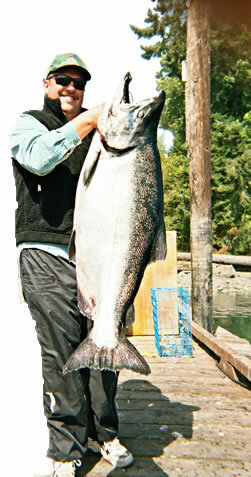 Come sport fishing with us for salmon, halibut, and crab. Unforgettable salmon and halibut fishing as well as wildlife sightings that may include seals, otters, eagles, sea lions, dolphins, porpoises, and pods of whales. We provide excellent value for your fishing dollar and only use the best rods, reels, tackle and bait to maximize your chances to lure and catch the trophy fish you are targeting. Our boat offers almost all the comforts of home, from the fully private stand-up washroom, to the heated cabin to keep you out of the cold on rainy days or open windows to keep you out of the sun on warm sunny days. The back deck of the boat has seating and a custom sunbrella for those enthusiasts who want to stay beside the rod ready for the fish to hit. Our boat is powered by a 300 hp 4 stroke engine. We’ll get you to the fishing grounds quickly, while you enjoy a comfortable ride on board a top class fishing boat. We run state-of-the-art commercial grade marine navigational equipment including radar for a safe journey, and use top of the line fish finding electronics for increasing your chances of finding the fish you are targeting.